I was just reading an article about children developing an attachment to certain objects just earlier today. 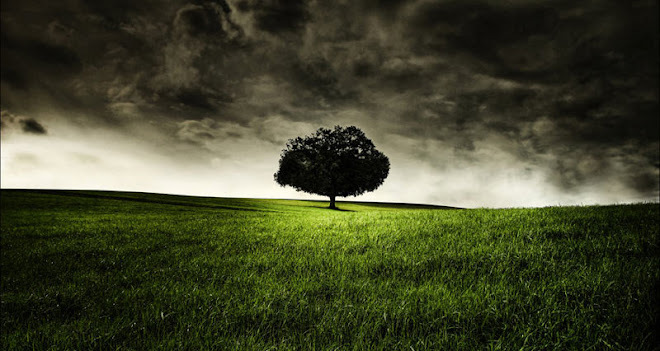 It stated that it usually occurs around 7 months or so. Then I went in to check on AJ and he was laying on his back with his Cookie Monster on his chest hugging him close (the picture above is from a couple days ago). When I was little I had a blanket that my Mom tells me she received as a gift (I'm guessing a baby shower gift). I still have that blanket and it is so tattered and torn. The satin around the edges has been sewn back on several times in a rainbow of colors. I loved that blankie and it just seemed to make everything OK. I think that AJ has found his "security blanket" or Security Cookie Monster. 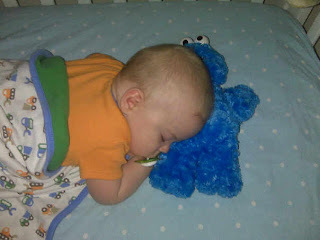 It's so sweet when I put him to bed he grabs Cookie monster and hugs him tight to his side. We'll see if this changes but as of now it's the soft, cuddly, blue Monster. AJ and I spent this past week in Albany. I went to work and he went to spend time with Granny and get his picture taken. I always feel so rushed when I'm there because that is where I do all of my "business" so to speak. I had not made an appointment with anyone to get pictures and had a limited amount of time so I got online and made an appointment with good ole Olan Mills. AJ is 7 months old now and I didn't want to let another month go by without getting this milestone picture of him sitting up good. It is so hard to wrap my brain around the fact that just a little over 7 months ago my baby was not even breathing the air of this world and in a little less than 5 months from now he will be 1year old! It's all happening so fast! He's on the verge of crawling. He gets on his knees and rocks but the rubber hasn't met the road yet. 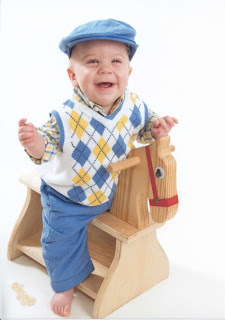 He is also teething (happy-happy, joy-joy). His 2 bottom teeth are just about to come on through. It's a wonder we got any good pictures with how much he was chewing on his hands but Mission Accomplished. We are SO HAPPY to be Home! AJ and I missed his Daddy A Bunch. I was so Happy to be able to call TJ and him hear Our Little Man say such Sweet words. When I look back at this picture I will have lots of memories and I just thank the Lord for in trusting TJ and I with this Little Angel.